Finding the right beach chair for you can seem like an almost impossible task. With beach chairs coming in a vast array of sizes, shapes and designs it can be difficult knowing where to begin. From the reclining beach chair to beach chairs with a cooler/umbrella/beach mat chair, there’s a lot of things to consider when you’re finding the perfect fit for you. 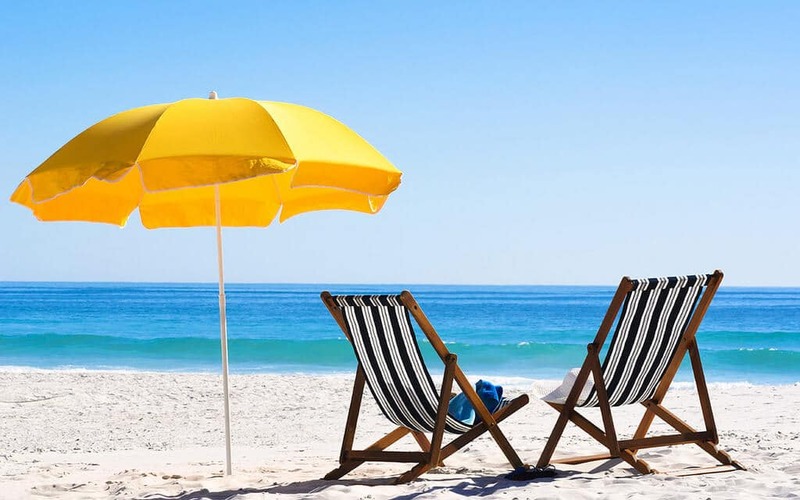 We’ve compiled a list of the 18 best beach chairs out there with the pros and cons and a short review on what to expect when buying a beach chair. Don’t have time to read all of this? One of the most classic looks you’d expect to see from a good quality beach chair. Low slung and with a drinks holder to boot, this chair is incredibly comfortable from the moment you settle into it. It comes with a nifty travel bag and is lightweight so it is easy to transport. But don’t let that fool you! 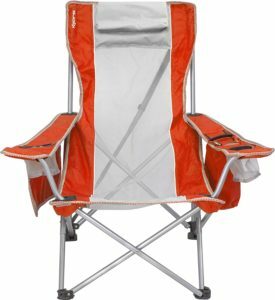 The Coleman Utopia is a sturdy beach chair that can support up to 250 pounds. Although it’s a great little chair it does struggle with the one thing you’d hope a beach chair to excel at and that’s the sand. Once sand gets into the chair it is difficult to fold and this makes it less than ideal for beach goers. 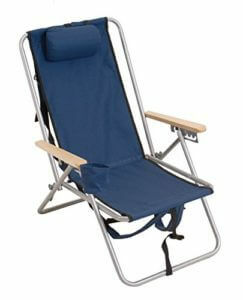 To conclude, despite the sand issue we can certainly recommend the purchase of this beach sling chair. 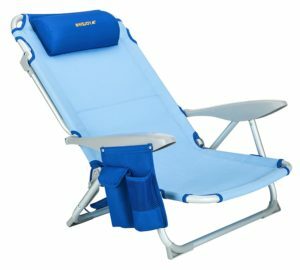 A stylish and adjustable way to enjoy the beach, the Rio Brands beach chair is one of the most appealing on the market. Coming in a wide variety of colors this chair has solid wood arms and a padded carry sling meaning it concentrates a lot on the user’s comfort. Having said that, the other materials are cheap quality and make it difficult to enjoy the chair on more than an aesthetic level. 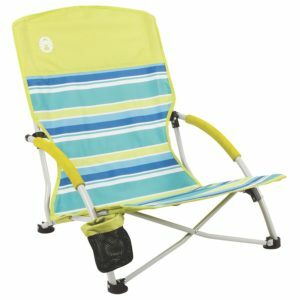 Although the chair offers 5 different positions and lying down is one of the best ways to soak up the sun at the beach, this chair doesn’t stand up to what it offers. A lot of strain is placed on the plastic components that are meant to adjust the positions. Although the quality of the materials used in this chair are exceptional, especially for the price tag, the overall comfort of the chair leaves a lot to be desired. The aluminum bars that are designed to stop the chair from sinking into sand or soft ground work excellently but they are also placed in such a way that they very easily dig into the lower back and neck. 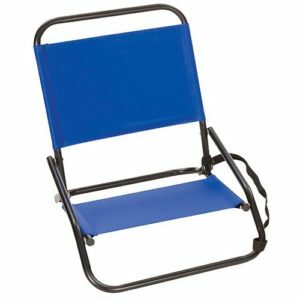 While this chair doesn’t offer any different positions the back of the chair is slightly too upright for a comfortable beach chair and the chair itself sits very low to the ground. Having said that, it is the ideal shape, weight and size for younger children to use and this is an incredibly affordable piece of kit especially for kids to use. Very affordable, especially for the quality of material used. If comfort is what you’re looking for in a beach chair then this one absolutely has you covered. With 4 adjustable positions, an adjustable pillow and comfortable arm rests with a drinks holder, this chair is one of the most comfortable on the list. Not only is it comfortable but it is easy to transport with a handy storage pouch and padded straps that mean it can be carries just like a backpack, this is a relatively lightweight yet sturdy answer to all your beach going questions. The biggest downside to this simple little chair is that it can be tricky to fold down at times but once you have the proper knack for it you won’t struggle at all. On paper, this is possibly one of the best beach chairs on this list. With a whole host of different add ons that make this chair seem too good to be true, especially for the price, the unfortunate news is that it largely is too good to be true. While it boasts a weight capacity of 300lb, extra wide seats, a cup holder, a pillow and a swing out towel bar, the whole package isn’t worthy of the money they’re asking for it. Why? Well, because the quality of materials that have been used aren’t up to scratch. While the integrity of the core chair area might stay together well, the arms and additional bars are flimsy at best. The joints aren’t well constructed and while it’s not the worst beach chair we’ve ever used, it’s far from the best. Swing out towel bar means you have somewhere to dry your towel when you’ve been for a swim. These chairs are definitely on the cheap and cheerful end of the beach chair scale but that isn’t always a bad thing. With impressive back support and being really lightweight, they fold flat making them easy to both store and carry. While there’s nothing lavish about these chairs they set out to do a simple job and that is a job that they do surprisingly well. While some might find these chairs slightly too low and they’re definitely not suitable for fuller figures, these chairs do task they set out to without any fuss. This is possibly one of the best beach chairs you can buy for the price it comes at. 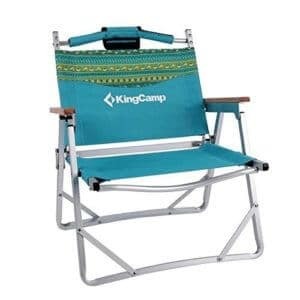 Well made, comfortable and incredibly easy to carry, KingCamp really know what they’re doing when it comes to making beach chairs. With a cup holder and foam wrapped arm rests, this chair is incredibly comfortable as well as being easy to use. Coming with a carry bag and compact straps, you will be able to pack this chair into your car at a second’s notice and not worry about putting it up or down at the other end. Backpack beach chairs tend to sell very well and that is down to how easy they are to transport as a result of this. Unfortunately, there are few other things that are good to say about this certain beach chair and that is a shame. There was a lot of potential for this chair to be great if somewhat simple. With 4 reclining positions, a pillow and durable hardwood arms, as well as being lightweight and having straps that make it really easy to carry round as a backpack – what more could you ask for? Unfortunately this chair has one too many faults to make it a chair worth the money they want for it and most of these issues come down to reliability. Problems with the fabric, straps and steel bars mean the integrity of this chair is completely compromised. 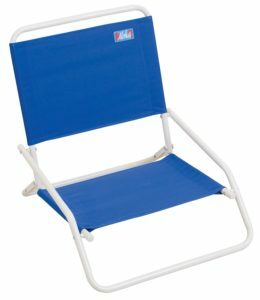 This is a beach chair that doesn’t sit as low as most but that doesn’t change the effectiveness of the overall chair. 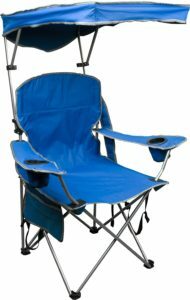 Incredibly comfortable and offering 2 cup holders and an eva line cooler, it is a stylish chair that comes in a wide variety of colors. 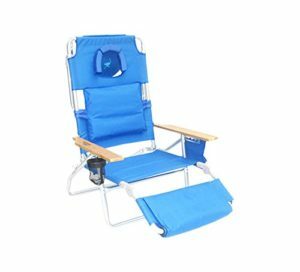 Well constructed and offering a detachable pillow as well as a zip pocket, mesh pocket and cell phone holder, this is the beach goers chair for those that like the finer things in life. The only thing holding this chair back from being a perfect 10/10 is that it only comes in one position and while this isn’t the worst thing in the world, for many people will be enough to put them off. Higher than your average beach chair, the Rio Beach Hi-Boy’s seat comes in at 17 inches above the sand. While this might not appeal to all this is definitely a massive plus for a lot of people as it makes it much easier to both get into but get out of. 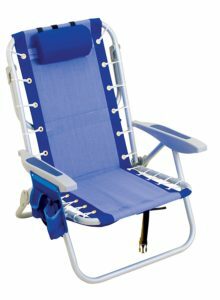 With a good quality build on this chair and 7 different positions, it’s a great chair for all your beach holiday needs. Although the carry strap has been padded for extra comfort the chair itself is slightly heavier than the average so carrying it long distances is out of the question but if you’ve managed to park close to your perfect spot then you’re be happy and comfortable in this chair. That’s not to mention the fact that it comes with a zippered pouch complete with cellphone holder as well as a drink holder. Unlike any beach chair on the list, this is possibly one of the most comfortable beach chairs you will ever come across. 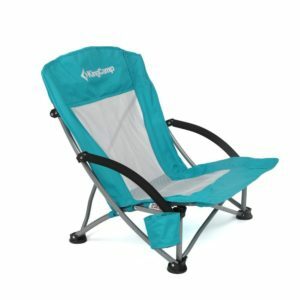 Incredibly lightweight, easy to transport and a great design, this beach chair is all about lounging around and comfort. There are no bells and whistles to this beach chair so if you’re looking for somewhere to store your cup and your personal items then this isn’t the chair. If you want to chill out at the beach in style and comfort then this definitely is the chair for you. Inflating simply by opening the end of the bag and running against the wind for around 20ft, it is relatively easy to inflate and gives your entire body full support. 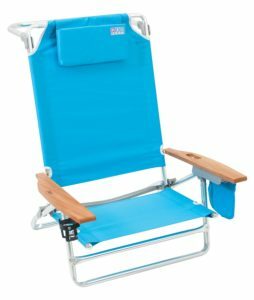 Although trips to the beach often involve soaking up the sun it is best to keep a little shade at hand and that’s exactly what this beach chair offers. 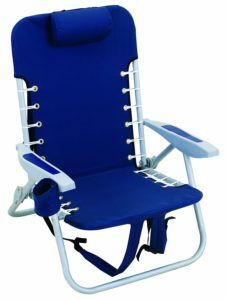 With a retractable canopy, 2 cup holders and a shoulder strap for easy transportation, this chair certainly offers a lot. This chair goes up and down very easily but it is far from perfect. Due to the narrow nature of the feet at the front of the chair, this is not the sturdiest chair in the world and will only tolerate light use before the rubber shields on the front feet break. This isn’t the most expensive chair on the list but for the money you’re paying, it’s possible to get something that can withstand a lot more use very easily. This chair is built for comfort and comfort it provides. With a handy umbrella that is easy to shift round into a position that suits where you’re sitting, 3 different recliner options and an easy to use footrest that detaches when you want a standard beach chair, it really does offer a lot. While this chair has a lot of features that make it incredibly appealing, there are a couple of issues that largely come down to reliability. Whether it’s the release button for the chair to unlock or the point where the footrest attaches to the rest of the chair, unfortunately this makes it difficult to fully relax. Having said that, if you are lucky enough to get one that has been perfectly constructed then you’ll be left with a lightweight chair with sup holders, insulated pockets and a zippered pocket with a built in bottle opener. It’s not all bad! When you go to the beach one thing you always look forward to is a nice cool drink with friends. This chair might be a bit on the pricey side but it is worth every penny. 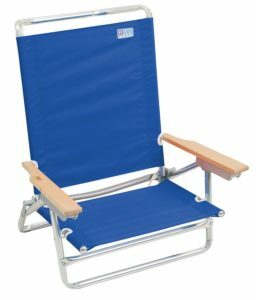 With a cushioned pillow, 5 reclining positions a towel rack and padded shoulder straps this is absolutely one of the most comfortable and easy to use chair on the list. 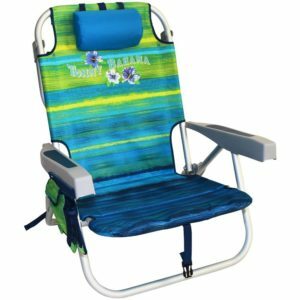 Comfortable, portable and with cushioned arms and a pillow this is the perfect beach chair for relaxing on for a whole day without a doubt. This is one of the priciest beach chairs on the market but just because something costs a lot doesn’t always make it good. 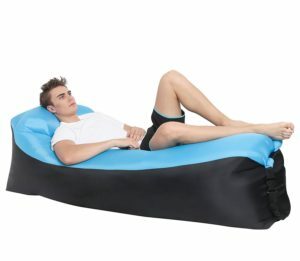 Although there are a lot of features that will appeal such as the foot rest, the cutout for your face when you lie on your front and the storage bag which includes two smaller Velcro closure bags within it, the overall quality of materials and build quality is unfortunately poor. Having used poor quality materials and being poorly constructed, you would expect it to either be a lot more sturdy or for the price to be significantly lower. Beach chairs that have different positions are always a winner as they give you the option of sitting up, reclining or even lying flat. This is very important when you’re going to the beach for the day. The best thing about the WeJoy is that they have taken the time and care to make the joints out of metal which makes them a lot more durable than those with plastic. Although the seat is larger than the average the weight limit is still only 264lbs which isn’t all that impressive for a beach chair yet with side and back pockets, a pillow and weighing only 6.6lbs, it’s definitely worth considering. This chair has no bells or whistles attached to it and that is absolutely perfect. It sets out to be a great beach chair and a great beach chair it is but if you want somewhere to store your drinks, towels and a nice little shade then you’ll have to get all of these separately. The good news is it’s completely worth it for a great value chair that is comfortable and will last for years to come. 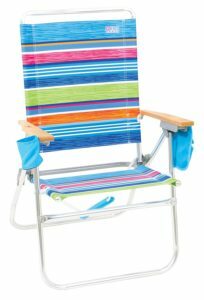 Easy to carry and with really simple putting up and down it’s easy to see why this beach chair is so popular. First of all let me state that there is a whole article dedicated to the best Tommy Bahama beach chairs. This model in particular sparked our interest as it has the best quality price ratio of this review guide. It comes with an aluminum frame and can support up to 300lb’s. It should be noted that this beach chair weighs 15lb which may be a little above the norm. This however also speaks for the quality of the chair. 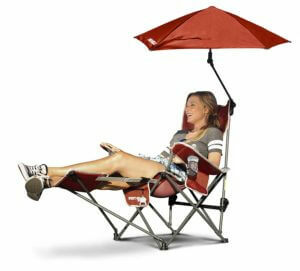 To sum it up, in our opinion this is the best beach chair you can buy on Amazon! Takes weights up to 300lb’s. Buying a beach chair might not be something that you had thought a lot about. But in order to make the most of your beach trip you definitely need to do some research. With lots of features available on different chairs you need to make sure you know what is important to you. (Especially before you spend your money) It could be somewhere to keep your drink, the look of the seat or even how high off the ground you’ll be sitting but if it’s important then don’t settle for anything less. Other things to consider are the weight of the chair, the quality of built and whether you need a pillow, canopy or umbrella attached. This is not only a question of personal preference. You may find yourself in a climate where it is actually essential to have an umbrella or canapoy to go along with your beach chair. We all love a sunny day at the beach but we all also know that staying in the sun for too long may bare health risks. Having a canopy is probably the best solution in this case. However in most cases a beach umbrella will also do the job. Sure, you could just buy an umbrella independently, but also keep in mind there are several models in this review guide that include an umbrella or even a canopy. Just be careful to pick a high quality product as there have been lots of customer complaints. Of course if you find a chair that fulfills most of your needs but not all of them then it’s completely possible to buy these things separately. For many, perfect preparation is key. When you’re going to be there all day it’s very unlikely that you will have all the essentials. Some examples include sunglasses, cooler, cell phone, beach toys, blankets and much more. If you love perfect planing, check out this beach holiday check list. There are so many different beach holiday items that you can use. There’s no reason to limit yourself so keep buying until you’re happy. By the way, if you don’t feel like lying around all day, make sure to check out this list of awesome beach games for adults! When you’re going to the beach it’s important to remember that while the sun is good you need to make sure you have somewhere to sit when it gets too much. As mentioned earlier, a separate umbrella can be an excellent way enjoy the beach but from the shade. Furthermore this means that numerous people can use it at a time and you can move it to suit your every need. Shade is incredibly important if you have little ones with you at the beach. After all too much sun bares the risk of getting skin cancer. Towels and baskets are other absolute essentials for a beach trip. A windbreak can provide more privacy. A cooler can make sure to keep your snacks and drinks cool all day. Beach holidays are excellent ways to enjoy yourself. They offer a wide range of benefits for all who are lucky enough to have them. Obviously the biggest one for most families is that beach holidays are incredibly fun. More than that, they’re fun for everyone involved! Sandcastles and playing in the sea combined with sunbathing is what we are all looking for. Add to that a BBQ and a few drinks and you are looking at a perfect holiday. Of course it’s not just families that can enjoy beach holidays and whether you like going for a dip in the sea or just chilling and reading a book in the sun, the beach is the perfect place to do this. Not only is the beach a fun place to visit but the health benefits are profound. Sun is an excellent way to boost vital vitamins that are good for the health but it’s also a proven way to improve your mood and this is one of the best distractions you could use from normal life. The world we live in is fast paced and busy so a beach holiday is about as far removed from this as you can get!